Griner tallied 21 points (8-12 FG, 5-6 FT), nine rebounds, six assists, four blocks and one steal in the 94-84 playoff loss at Seattle on Tuesday. Griner fell one rebound shy of a double-double as she managed 21 points on 66.7 percent shooting while grabbing a team-leading nine rebounds during the loss Tuesday. With the loss, Griner's sixth WNBA season officially concludes where she averaged 20.5 points and 7.7 rebounds across 34 regular season games. Griner had 23 points (11-19 FG, 1-1 FT), 10 rebounds, three assists and two blocks during the Mercury's 91-87 playoff loss against the Storm on Tuesday. This was the first double-double in the postseason for the former Baylor Bear, as she managed 23 points on 57.9 percent shooting while grabbing a team-leading 10 rebounds in the loss Tuesday. Currently in the playoffs, Griner is averaging 20.0 points and 6.0 rebounds over four outings. Griner finished with 13 points (6-12 FG, 1-2 FT), five assists, four rebounds, two blocks and one steal in the 91-87 playoff loss against the Storm on Sunday. It obviously wasn't the best performance for the former Baylor standout Sunday, as she managed only 13 points while hauling in just four rebounds in the loss. So far over three postseason games, Griner is averaging 19.0 points and 4.7 rebounds per contest. Griner posted 17 points (8-12 FG, 1-4 FT), five rebounds, three assists, one steal and one block in the Mercury's 101-83 playoff victory against the Wings on Tuesday. 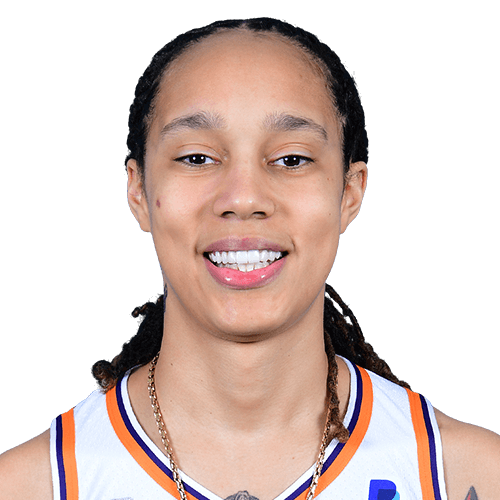 Despite shooting just 25.0 percent at the free-throw line, Griner totaled 17 points on an eight-of-12 mark from the floor to help lead the Mercury into the second round of the 2018 WNBA Playoffs. The former Baylor Bear averaged 20.5 points, 7.7 rebounds and 2.1 assists across 34 appearances during the regular season. Griner tallied 33 points (14-21 FG, 5-8 FT), 18 rebounds, seven blocks and one assist across 37 minutes during Friday's 104-95 victory over Atlanta. Griner's performance was one of the best of her career, and it resulted in a victory. She came just five points shy of her career high in scoring, matched her career high in rebounding, and matched her season high in blocks. The effort also marked Griner's third game in four tries with at least 20 points and 11 rebounds. Griner collected 35 points (15-25 FG, 5-5 FT), 11 rebounds, three assists and one block in Tuesday's 103-98 loss against the Mystics. For the first time in nearly a month, Griner reached the 30-point mark as she dropped a game-high 35 points Tuesday while also grabbing 11 rebounds to total her eight double-double of the season. In 30 games played in 2018, the two-time WNBA Defensive Player of the Year is averaging 20.8 points and 7.3 rebounds per outing. Griner dropped 25 points (8-13 FG, 9-14 FT), 11 rebounds, four assists and two steals in the 104-93 road win over the Aces on Wednesday. Griner again managed 25 points in the win Wednesday by shooting 61.5 percent from the field while also adding 11 rebounds to mark her seventh double-double of the year. So far, the 2017 WNBA Peak Performer Award winner has safely scored in double figures in all 28 games played this year and she is averaging 20.2 points a contest. Griner posted 25 points (9-16 FG, 7-10 FT), seven assists, six rebounds, three blocks and one steal in the 102-91 home loss against the Storm on Tuesday. After dealing with back spasms the last couple weeks, it's looks like Griner has recovered quite well, as she dropped a team-high 25 points on 56.3 percent shooting from the field as well as a game-best seven assists Tuesday. Over 27 appearances this year, the former Baylor Bear is averaging 20.0 points, 7.1 rebounds and 2.7 blocks per outing. Griner amassed 12 points (4-9 FG, 4-4 FT) and two rebounds in the 101-87 home loss to the Sky on Wednesday. Dealing with back spasms, Griner started but played in only 16 minutes and recorded just 12 points on 44.4 percent shooting and two rebounds. Due to make her fifth appearance in the All-Star game this weekend, the 28-year-old is so far averaging 19.8 points and 7.2 rebounds per contest this year. Griner (back) will play and start Wednesday's game against the Sky. Griner has been dealing with some back spasms, but came into Wednesday with a probable designation and was always expected to take the court. She'll stick in the starting five as usual and considering her season averages of 20.2 points, 7.4 rebounds, 1.8 assists and 2.8 blocks, Griner will once again be an elite DFS play.